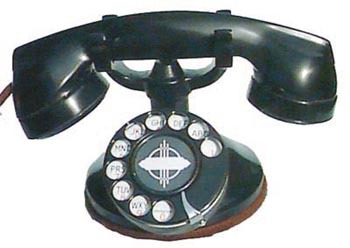 This is classic art deco, this beautifully restored phone will add charm to you dining room, library, or den. The phone has been completely refurbished. Bakelite parts have been cleaned and polished to a like new shine. Metal surfaces are cleaned, polished, and painted as needed. The dial has been carefully cleaned and calibrated to provide years of troublefree service. This phone is fully functional and comes with a 6 ft. line cord with a modular end. The phone is ready to be plugged into your home system. There is a 30 day return privilege.